EK-Supremacy EVO Threadripper Edition is a special variation of the EK-Supremacy EVO flagship water block. This water block perfectly fits the new TR4 socket motherboards and comes with pre-assembled, error-preventing mounting mechanism. The result is a perfect installation which results in superb performance every time. EK-Supremacy EVO Threadripper™ Edition is a special variation of the EK-Supremacy EVO flagship water block. This water block is tailor made for AMD® Ryzen™ Threadripper™ processors and it perfectly fits the new SocketTR4 motherboards. It comes with pre-assembled, error-preventing mounting mechanism, the result is a perfect installation which results in superb performance every time. The primary goal in designing the new EK-Supremacy EVO Threadripper™ Edition water block was to cover the entire IHS of the newly released HEDT AMD® Ryzen™ Threadripper™ processor. With a dense micro-fin structure the EK-Supremacy EVO Threadripper™ Edition water block offers the best possible cooling performance! 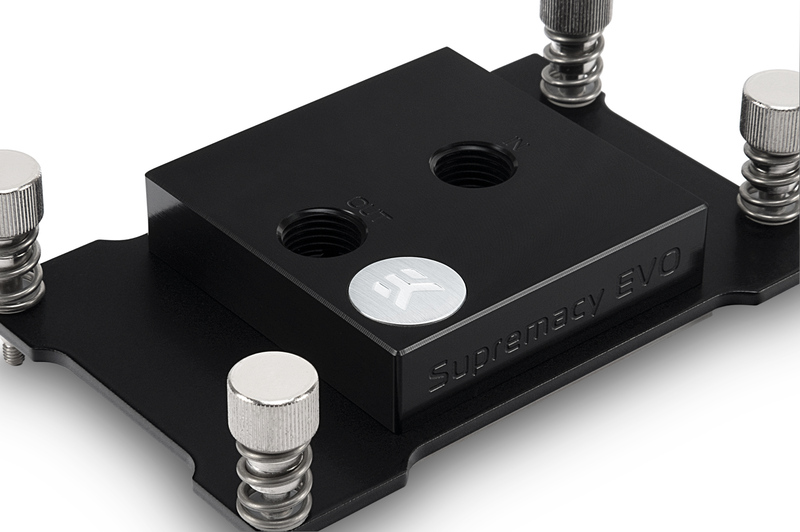 The water block uses award-winning EK-Supremacy EVO cooling engine with specialized jet insert and jet plate combination to ensure best possible cooling for X399 chipset based CPUs. The top is made from CNC machined POM Acetal. To ensure the optimal flow, the insert is pre-installed and made from injection molded ABS polymer. This EK-Supremacy EVO Threadripper™ Edition water block comes with a large precisely machined copper base (sometimes referred to as ‘cold plate’) which is made from purest copper available on the market and is treated with nickel electroplating and further polished to absolute mirror finish. EK-Supremacy EVO Threadripper™ comes with a pre-assembled error-preventing mounting mechanism that is installed directly onto the SocketTR4 mounting holes. The result is a perfect installation which results in optimal performance every time. This also means the water block is out of the box compatible with AMD® server type Socket SP3 motherboards. With such a mounting solution, the user does not need to remove the motherboard from the case and so has a hassle free installation procedure of the new CPU. The water block comes enclosed with a small tube of high-performance Thermal Grizzly Hydronaut thermal grease. It’s suitable for high demanding users and for overclocking due to its excellent thermal conductivity. The thermal grease consists of a silicon-free structure, this makes it very light and highly flexible and easy to apply. It’s recommended that users follow the EK-Supremacy EVO Threadripper™ Edition water block installation manual for the suggested method of thermal grease application for the best-expected results.